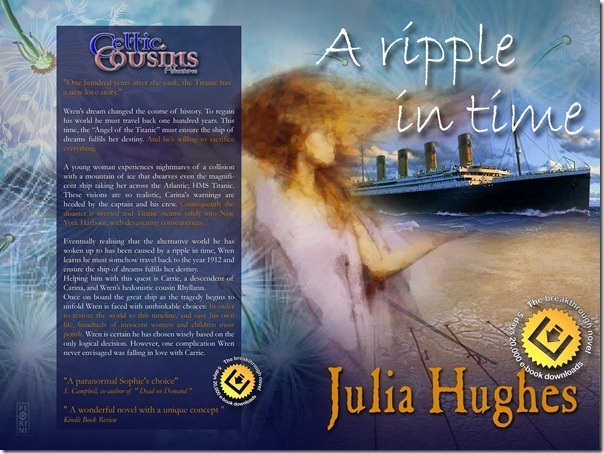 At the beginning of the summer, I had the great pleasure to meet a fellow author on the twitverse, Julia Hughes. 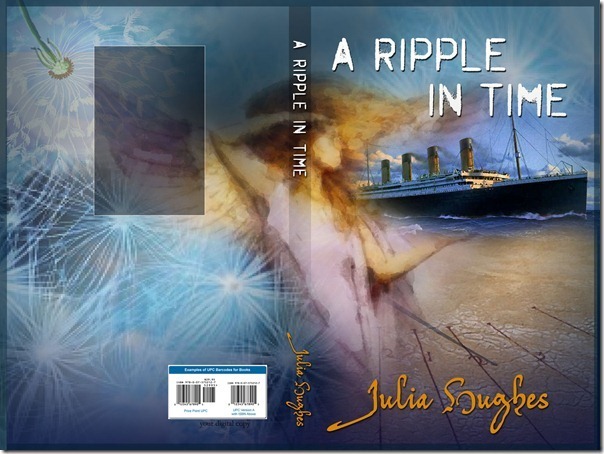 Julia was running a promotion for her novel A Ripple in Time and I was immediately intrigued by its blurb: “After one hundred years, the Titanic has a new love story.” Julia and I started tweeting, also thanks to a common friend, Randall Peterson who was promoting her book and mine. A friendship was born out of 140 characters at a time. 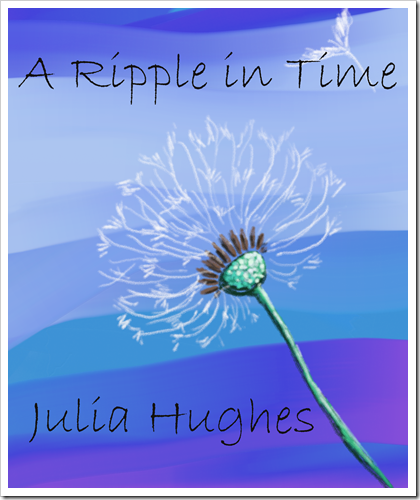 Later, Julia saw my drawings and asked me if I wanted to work on the new cover for A Ripple in Time, which meanwhile had had more than twenty thousand downloads in mere five days. I was flattered that my naïf art had caught Julia’s attention. Her proposal arrived at an odd moment for me, I was leaving to go back to Italy for a long stay due to family reasons. 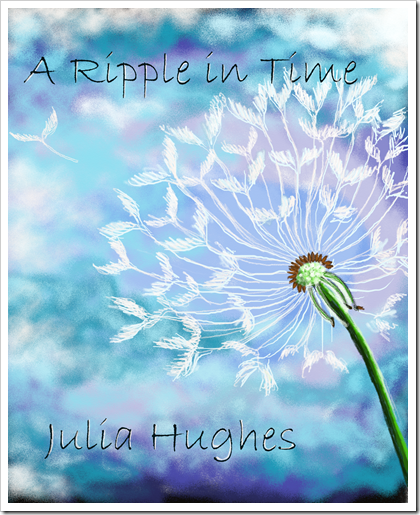 My mind was stretched in several directions at once, but Julia assured me she was in no hurry. Nevertheless, I don’t like to have people waiting on me when I accept to work on a project, and so once Julia told me what she wanted on the cover, I started playing with my tablet. One of her requirements was that the cover must have dandelion flowers and seeds. I had never drawn a dandelion flower before and I scouted the web for good images I could use as reference. It turns out, I love drawing dandelions and dandelions seeds. Below are my first and second mock covers and the banner. Once the backdrop was done, I asked my cover artist and dear friend, Alessandro Fiorini to come onboard. I gave him the specifics of what Julia wanted on the cover: a sundial, a winged figure, and of course the Titanic. I thought it was a solid work and sent the image to Julia. Once we received the okay from her, Alessandro and I started working on the details. Despite a particularly hot Italian summer, internet failures, and life in general, a few weeks later we were able to send Julia the final cover. Below is one of the final tries and the banner. Working with Alessandro is always a treat and Julia is one fabulous patron of the arts and it was an absolute pleasure to create a cover for her imaginative novel. That is beautiful! Thanks for sharing the process with us. Thank you, Clare 🙂 It was great fun working on this project! The sons have orders to have this cover printed as a poster for my Christmas present. I could spend all day just gazing at this enchanting work of art. Thank you, Monica, and thank you Alessandro. I still feel extremely lucky that you both agreed to create this cover. It was our absolute pleasure to work with you, Julia 🙂 You must post a pic of yourself and the poster as soon as you have it!